Lord Bring Me Into Thy Holy of Holies! An external sanctuary, a material structure, and therefore belonging to this world. Hebrews 9:2. For there was a tabernacle made; the first, wherein was the candlestick, and the table, and the shewbread: which is called the sanctuary. Notice especially those words, “Not without blood.” There could be no approach to God under the old dispensation without the shedding of blood, and there is no access to the Lord now without the precious blood of Christ. Hebrews 9:9-22. Which was a figure for the time then present, in which were offered both gifts and sacrifices, that could not make him that did the service perfect, as pertaining to the conscience; which stood only in meats and drinks, and divers washings, and carnal ordinances, imposed on them until the time of reformation. But Christ being come an high priest of good things to come, by a greater and more perfect tabernacle, not made with hands, that is to say, not of this building; neither by the blood of goats and calves, but by his own blood he entered in once into the holy place, having obtained eternal redemption for us. For if the blood of bulls and of goats, and the ashes of an heifer sprinkling the unclean, sanctifieth to the purifying of the flesh: how much more shall the blood of Christ, who through the eternal Spirit offered himself without spot to God, purge your conscience from dead works to serve the living God? And for this cause he is the mediator of the new testament, that by means of death, for the redemption of the transgressions that were under the first testament, they which are called might receive the promise of eternal inheritance. For where a testament is, there must also of necessity be the death of the testators. For a testament is of force after men are dead: otherwise it is of no strength at all while the testator liveth. Whereupon neither the first testament was dedicated without blood. For when Moses had spoken every precept to all the people according to the law, he took the blood of calves and of goats, with water, and scarlet wool, and hyssop, and sprinkled both the book, and all the people, saying, This is the blood of the testament which God hath enjoined unto you. Moreover he sprinkled with blood both the tabernacle, and all the vessels of the ministry. And almost all things are by the law purged with blood; and without shedding of blood is no remission. This exposition consisted of readings from Leviticus 16:1-31; And Hebrews 9:1-22. Hebrews 9:1. Then verily the first covenant had also ordinances of divine service, and a worldly sanctuary. That is to say, a material sanctuary, a sanctuary made out of such things as this world contains. Under the old covenant, there were certain outward symbols. Under the new covenant, we have not the symbols, but we have the substance itself. The old law dealt with types and shadows, but the gospel deals with the spiritual realities themselves. All this was by divine appointment; the form of the rooms, the style of the furniture, everything was ordained of God; and that not merely for ornament, but for purposes of instruction. As we shall see farther on, the Holy Ghost intended a significance, a teaching, a meaning, about everything in the old tabernacle, whether it was a candlestick, or a table, or the shewbread. Hebrews 9:4-5. Which had the golden censer, and the ark of the covenant overlaid round about with gold, wherein was the golden pot that had manna, and Aaron’s rod that budded, and the tables of the covenant; and over it the cherubims of glory shadowing the mercy seat; of which we cannot now speak particularly. It would not have been to the point which the apostle had in hand, so he waived the explanation of those things for another time. It was necessary that you should take away the sacred tent, the tabernacle, ay, and take away the temple, too, before you could learn the spiritual meaning of them. You must break the shell to get at the kernel. So God had ordained. Hence, there is now no tabernacle, no temple, no holy court, no inner shrine, the holy of holies. The material worship is done away with, in order that we may render the spiritual worship of which the material was but the type. All these rites could only give a fleshly purity, but they could not touch the conscience. If men saw what was meant by the outward type, then the conscience was appeased; but by the outward sign itself the conscience was never comforted, if it was a living and lowly conscience. Hebrews 9:10. Which stood only in meats and drinks, and divers washings, and carnal ordinances, imposed on them until the time of reformation. These ordinances were only laid upon the Jews-not upon any other people-and only laid upon them until the better and brighter days of reformation and fuller illumination. Hebrews 9:12. Neither by the blood of goats and calves, but by his own blood he entered in once into the holy place, having obtained eternal redemption for us. The Jewish high priests went once a year into the Holy of Holies. Each year as it came round demanded that they should go again. Their work was never done; but “He entered in once,” and only once, “into the holy place, having obtained eternal redemption for us.” I love that expression, “eternal redemption”-a redemption which really does redeem, and redeems forever and ever. If you are redeemed by it, you cannot be lost; if this redemption be yours, it is not for a time, or for a season, but it is “eternal redemption.” Oh, how you ought to rejoice in the one entrance within the veil by our great High Priest who has obtained eternal redemption for us! Hebrews 9:13-15. For if the blood of bulls and of goats, and the ashes of an heifer sprinkling the unclean, sanctifieth to the purifying of the flesh: how much more shall the blood of Christ, who through the eternal Spirit offered himself without spot to God, purge your conscience from dead works to serve the living God? And for this cause he is the mediator of the new testament, that by means of death, for the redemption of the transgressions that were under the first testament, they which are called might receive the promise of eternal inheritance. When you come to deal with Christ, you have to do with eternal things. There is nothing temporary about Him, or about His work. It is “eternal redemption” that He has obtained for us, it is an “eternal inheritance” that He has purchased for us. Hebrews 9:16-17. For where a testament is, there must also of necessity be the death of the testator. For a testament is of force after men are dead: otherwise it is of no strength at all while the testator liveth. Or, “Where a covenant is, there must also be the death of him who covenants, or of that by which the covenant is established.” Or read it as we have it in our version, for it seems as if it must be so, although we are loathe to give the meaning of “testament” to the word, since its natural meaning is evidently covenant: “Where a testament is, there must also of necessity be the death of the testator. For a testament is of force after men are dead; otherwise it is of no strength at all while the testator liveth”; or, if you will, while the victim that was to confirm the covenant lived, the covenant was not ratified; it must be slain before it could be thus effective. Hebrews 9:18-22. Whereupon neither the first testament was dedicated without blood. For when Moses had spoken every precept to all the people according to the law, he took the blood of calves and of goats, with water, and scarlet wool, and hyssop, and sprinkled both the book, and all the people, saying, This is the blood of the testament which God hath enjoined unto you. Moreover he sprinkled with blood both the tabernacle, and all the vessels of the ministry. And almost all things are by the law purged with blood; and without shedding of blood is no remission. These things down below are only the patterns, the models, the symbols of the heavenly things; they could therefore be ceremonially purified with the blood which is the symbol of the atoning sacrifice of Christ. There is no need that He should die again, His one offering has forever perfected all His people. There remains nothing but His final coming for the judgment of the ungodly, and the acquittal of His redeemed. Hebrews 9:28. And unto them that look for him shall he appear the second time without sin unto salvation. Christ’s second coming will be “without sin,” and without a sin offering, too, wholly apart from sin, unto the salvation of all His chosen. May we all be amongst those who are looking for Him! Amen. Hebrews 9:18-22. Whereupon neither the first testament was dedicated without blood. For when Moses had spoken every precept to all the people according to the law, he took the blood of calves and of goats, with water, and scarlet wool, and hyssop, and sprinkled both the book, and all the people, saying, This is the blood of the testament which God hath enjoined unto you. Moreover he sprinkled with blood both the tabernacle and all the vessels of the ministry. And almost all things are by the law purged with blood; and without shedding of blood is no remission. Hebrews 9:23-26. It was therefore necessary that the patterns of things in the heavens should be purified with these, but the heavenly things themselves with better sacrifices than these. For Christ is not entered into the holy places made with hands, which are the figures of the true, but into heaven itself, now to appear in the presence of God for us: nor yet that he should offer himself often, as the high priest entereth into the holy place every year with blood of others; for then must he often have suffered since the foundation of the world: but now once in the end of the world hath he appeared to put away sin by the sacrifice of himself. In every respect, our great High Priest was superior to the high priests under the law; though, in some points, they resembled him, and were types of him. Hebrews 9:27-28. And as it is appointed unto men once to die, but after this the judgment: so Christ was once offered to bear the sins of many and unto them that look for him shall he appear the second time without sin unto salvation. His one offering so fully met all the claims of divine justice on behalf of all his people that there was no need of another offering for sin, and no room for it, so his second coming will be “without a sin offering unto salvation,” as the passage may be rendered. This exposition consisted of readings from Hebrews 9:18-28; and Hebrews 10:1-25. Hebrews 9:25-26. Nor yet that he should offer himself often, as the high priest entereth into the holy place every year with blood of others; for then must he often have suffered since the foundation of the world: but now once in the end of the world hath he appeared to put away sin by the sacrifice of himself. Hebrews 9:27-28. And as it is appointed unto men once to die, but after this the judgment: so Christ was once offered to bear the sins of many; and unto them that look for him shall he appear the second time without sin unto salvation. He had to suffer because of sin once, but he will never again have to do that; his sacrifice will never need to be repeated, and never can be repeated. This exposition consisted of readings from Hebrews 9:24-28; and Hebrews 10. Spurgeon, Charles Haddon. “Commentary on Hebrews 9:4“. “Spurgeon’s Verse Expositions of the Bible”. https://www.studylight.org/commentaries/spe/hebrews-9.html. 2011. [ Psalm 95 ] Come, let us sing for joy to the Lord; let us shout aloud to the Rock of our salvation. Let us come before him with thanksgiving and extol him with music and song. In spiritual warfare victory is assured since Jesus Christ has already won it on the cross and in the resurrection. Christians will eventually share in Christ’s complete victory and through him overcome their spiritual enemies. Victory is received by faith. Spiritual warfare is resisting, overcoming and defeating the enemy’s lies (in the form of deception, temptations and accusations). Spiritual Warfare deals with three key things the enemy sends at us: temptations, deception and accusations. Spiritual warfare comes in two ways: offensive and defensive. Offensive warfare is tearing down the strongholds the enemy has formed in your mind through deception and accusations, and defensive warfare is guarding yourself against the tactics or schemes of the devil. #1 Deception: To deceive somebody means to make another person believe a lie or something that is not true. When the enemy sends deception your way, it is an attempt to deceive you into believing something that is not true, so you will fall into error. Strongholds are built through deception. A stronghold is formed when deception takes hold in a person’s mind. A stronghold is an incorrect thinking pattern that stems from believing something that is not true. From the very beginning, Satan deceived Eve into believing that God’s Word was not true. In Genesis 3:4, the devil told her that she will not surely die as God said she would in Genesis 2:17. #2 Temptation: Temptation often follows deception. First the enemy tells us, “You won’t surely die!”, then he makes the fruit on the forbidden tree look good to us. Since Eve accepted Satan’s deception (his lie), now the tree that she was not supposed to touch looked good to her. She was tempted (enticed) to sin, because she allowed herself to first be deceived. Temptation is when we are enticed or encouraged to sin in one way or another. When the enemy tempts you, he’s showing you the worm… but behind that worm is a hook. The Word of God helps you see the hook behind the worm. #3 Accusations: The devil is known as the accuser of the brethren (Rev 12:10). He is known to take a believer who has done an embarrassing or gross sin in their past, and continue to rub it in their faces and beat them down with guilt and condemnation over their past. We have two weapons to deal with deceptions: the belt of truth (Ephesians 6:14) and the sword of the Spirit (Ephesians 6:17) which is the Word of God. Both are truth, which is found in God’s Word, so why are they given two different names (a sword and a belt)? Because one is meant to be defensive (the belt), while the other is meant to be offensive (the sword). 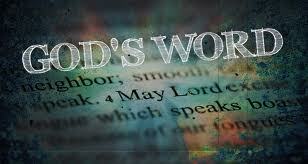 This means that the Word of God is both an offensive and a defensive weapon. A belt is something you wear to guard against an attack, while a sword is used to slaughter the enemy. You use the belt of truth (God’s Word) to guard against the enemy’s deception (lies) he sends your way, while you use the sword of the Spirit (also God’s Word) to tear down existing strongholds (deception that took hold) in your mind. The fiery darts of the enemy in Ephesians 6:16 are accusations sent our way. For example, when the devil tries to accuse us of our past sins, we are to have faith in the work of the cross and know that they are forgiven and not to look back. Faith is what we use to put out the fiery darts of the enemy (Ephesians 6:16). We are not to meditate about our pasts, because they have passed away (2 Corinthians 5:17), and our sins have been forgotten (Hebrews 10:17). Our righteousness is as filthy rags (Isaiah 64:6), but because of the work of the cross, we can receive the righteousness of God through Christ Jesus (Romans 3:22, Galatians 3:6). Therefore when the enemy tries to remind you of your past, tell him it’s been washed away (2 Corinthians 5:17), your sins have been forgotten (Hebrews 10:17) and you have the righteousness of God (Romans 3:22)! A stronghold is deception that’s taken hold in a person’s mind. It’s an incorrect thinking pattern based on a believed lie. People can get incorrect perceptions of God by listening to Satan as he tells them how God doesn’t love them, etc. People can feel like dirty old sinners when they believe Satan’s accusations as he continually reminds them of their past (which has been washed away!). Strongholds are based on lies from the devil. They can come in the form of deception or accusations. Accusations always lead to guilt and the feeling of unworthiness, which weighs you down and tears you apart spiritually. Since strongholds are built upon lies that we have been fed, the way we tear down strongholds is by feeding on the truth (in God’s Word), which is the opposite of what the enemy has been feeding us. If the enemy has been feeding us a lie, we need to stop eating the lie and start feeding ourselves the truth. The weapon we use to tear down strongholds is found in Ephesians 6:17, “…the sword of the Spirit, which is the word of God.” A sword is an offensive weapon and is meant to tear down and kill the enemy’s troops. Strongholds are the devil’s assets in war, and he uses them against us. Take up the sword of the Spirit (God’s Word) today, and start slaughtering the enemy’s assets that he’s been using against you! 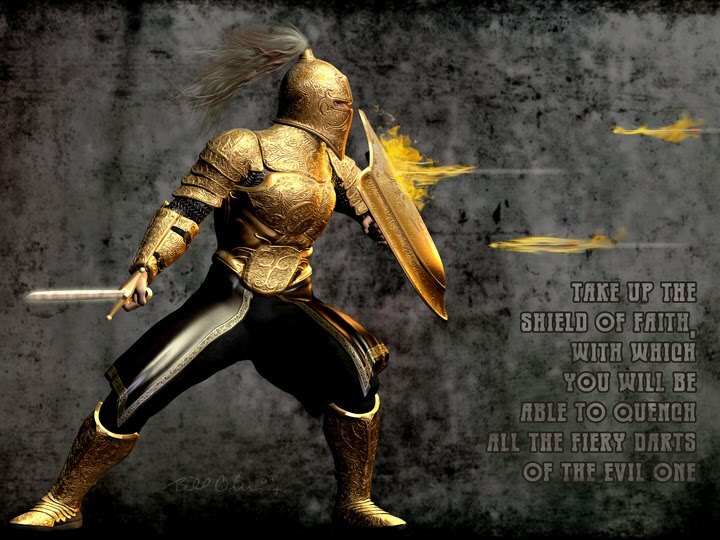 …taking the shield of faith with which you will be able to quench all the fiery darts of the wicked one. ARE WE PREPARED FOR THE WEDDING OF JESUS CHRIST?